Inside the home, guests can relax across two oceanfront king suites on the main level, and 2 guest bedrooms on the upper level with king and 2 twin beds. The oceanfront living area is flooded with stuning views of the water and furnished with plush couches, a comfortable sleeper sofa (for children only) and large flat screen TV. A full modern kitchen comes equipped with modern appliances, breakfast counter and seating, plus views of the beach behind the indoor dining table with seating for 6. Guests can opt for al-fresco dining out on the elevated deck which spans the entire width of the house and comes furnished with an outdoor seating for 8, plus rocking chairs and built-in benches. Combined with its convenient Northside location, it’s easy to see why Castaway Cove is an inviting destination and an excellent value for families and large groups. With no properties adjacent to Castaway Cove guests are assured maximum privacy and relaxation. 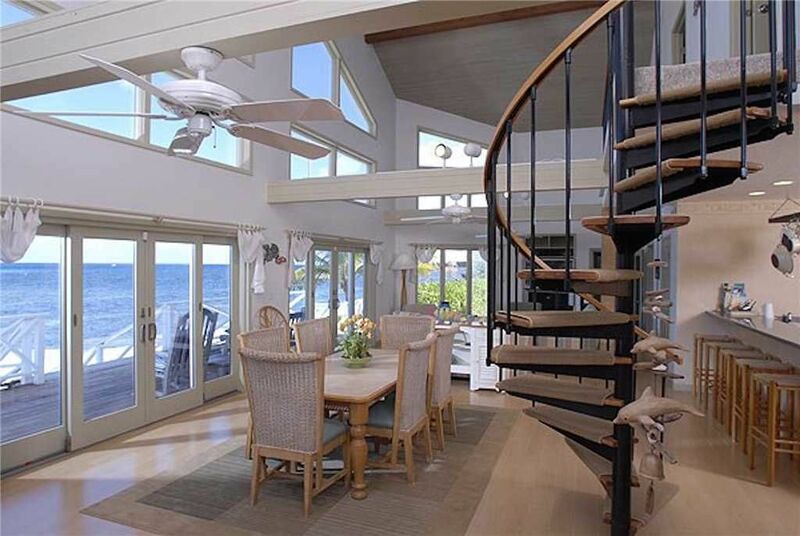 A full modern kitchen comes equipped with modern appliances, breakfast counter, and seating, plus views of the beach. Indoor dining table with seating for 6. Outdoor seating for 8, plus rocking chairs and built-in benches. We had a major power outage after an electrical storm in November and have been working to get everything repaired...thus the extra microwave on the counter. Not our choice either, but we are doing our best to accommodate guests while we wait for the correct parts to come in. The exhaust fan was working when we were there in late January, but I will make sure that our property manager follows up on getting that fixed. I’m sorry it took so long for the security system people to correct the beeping problem. One way to get to the wonderful snorkeling without having to deal with the seaweed is to use the ladder at the end of the dock (inside the gazebo) and swim right out to the coral outcroppings. It is worth it! Thank you for your review, and we will continue to work through these issues...except the weather which we haven’t had much luck with! Went with a group of friends and we loved it! Pictures are very accurate and the home has plenty of amenities, as if you were staying at a friends house. Games, books, extra chairs and everything in the kitchen. The property owners, along with Silver Thatch AND the cleaning lady Chloe, were very personable and helpful! Be aware the north side of the island has plenty of wind so snorkeling off our beach front was not possible. That was strictly due to weather though. With calm/warm weather snorkeling would be possible. Also, FYI, there is a enormous amount of seaweed on the beach, limiting space to lounge or lay out in the sand. The seaweed is piled up along the entire stretch of coast 2 feet high and litter is abundant! Again, nothing against the property, more a public service announcement for the northern part of the island. Unfortunately it is impossible to contain Mother Nature. Storms in early in mid-Jan came from due north, and brought in seaweed and debris. Normally the weather is from the east and the north side of the island does not have a large seaweed problem. Glad you enjoyed your stay and the home. It was great to have a few paper products already there, plus extra pillows, beach towels, light switches were labeled and phone numbers for anything we needed. The home is very comfortable and nicely decorated with plenty of space, rooms and bathrooms for everyone. Beautiful house and view, great location! Had a great time! Would stay here again. Our stay was 12/28/16 - 1/4/17. Our party of 8, 2 families of 4, had a wonderful time at this home. Description of property is very accurate. Very private location. You have to have a car to stay here. The house was very clean, and was perfect for us. We loved snorkeling from their pier, and even if the water seemed a bit rough (not every day), the current conditions were not bad for swimming. Very pretty coral! The beach is not your clean white sand at a resort, but was very enjoyable. The only issue I had with the house (reason for 4 stars) is that I slept in the master suite and at night I love the windows open to listen to the ocean and you cannot open the sliders at all, they are completely caulked on the outside and the room has no windows so we had to have A/C on. I think overall weather is hit or miss, 5 of our 7 days were windy and 2 were not. The 2 that weren't were buggy and the other 5 weren't. But you are in a tropical location so bugs are to be expected. We enjoyed the deck everyday and wonderful stargazing at night. I have to say, overall the house was very nice and I would definitely recommend staying there. Thank you for your review. We will look into the window situation and rectify that for future guests. The entire island is only 22 miles wide from west to east, so you are never too far from anywhere on Grand Cayman. The homes in Northside offer great reef protected snorkeling. The beaches in Northside can have plenty of white sand, but can also be pebbly or “ironshore” with natural rock formations. Either way, with the abundant marine life we have in the water, you will want to wear foot protection (pool shoes or fins). The prevailing trade winds from the east also make flying insects less of a nuisance—many of the homes on Northside don’t even need a screened porch. In Northside we have a primary school, a health clinic with ambulance service, a post office, and a small grocery store for the essentials. Closer to Old Man Bay is Over the Edge restaurant, a great casual restaurant with good food and reasonable prices. From the Northside, it's an easy 10 minute drive to Rum Point, as well as 10-15 minute drive to The Lighthouse restaurant, Tukka restaurant in east end, and the 2 east end resorts—Morritts and The Reef. Both resorts offer bars, restaurants, pools, water sports, a grocery store, and local lunch spots.